Step 1 Heat the oil in a large saucepan over medium heat. Add the onion, garlic and red and green peppers. Cook, stirring, until the onion and peppers start to soften, about 5 minutes. Add the tomato and rice and cook another 2 to 3 minutes until the tomato softens. Step 2 Stir in the chorizo and the chicken broth. Bring to a boil, cover and reduce the heat to low. Simmer until the rice is tender but still quite moist, about 15 minutes. Step 3Stir in the shrimp, cover the pan and cook until the shrimp are opaque and pink, 2 to 3 minutes. Stir in the parsley and serve. In Recipes-list.com we have selected the most viewed recipes from category - Best recipes Fish and shellfish Main courses Quick and easy . Enjoy the best recipes specially selected for you! 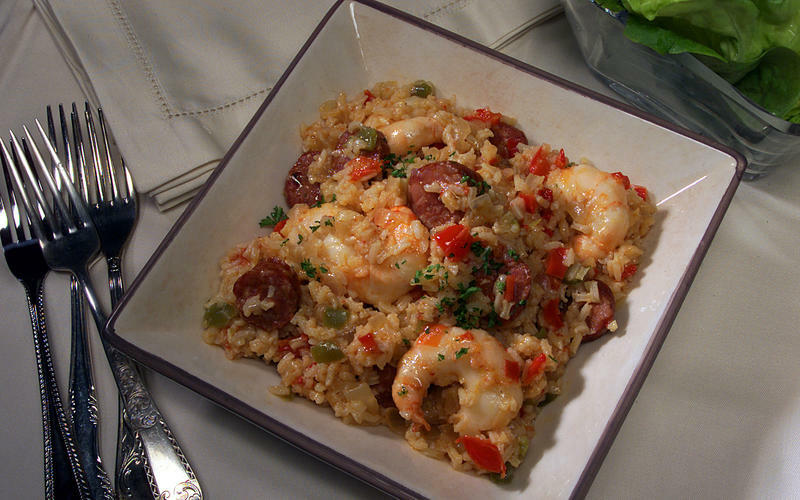 Arroz con chorizo y camarones is the right choice that will satisfy all your claims.